A friend of mine asked me the other day, “Where can watch a flight online?” Well, in this article I am going to tell you how to track a flight online. When I first heard about the ability to watch a flight online, I must say that I was completely in awe. I thought that this was something talked about but not actually possible. However, it turns out that is very simple to go online and track anybody’s flight to find out where it is in the great sky above. Apparently, if you are on top of this, gone are the days of calling up the airport, punching in flight numbers, and getting some kind of automated response about whether a flight is on time or not. This technology truly mesmerized me even though I suppose it is some sort of simple GPS tracking that the airlines use and have kindly made available to us. Anyway, let’s get to it and I will show you where you can watch a flight online and just how incredibly easy it is. Put in the name of the airline and the flight number. If you don’t know that information, the site has a lookup form that you can use. Isn’t this absolutely the coolest thing? You can actually see where the flight is at this exact moment flying in the friendly skies. 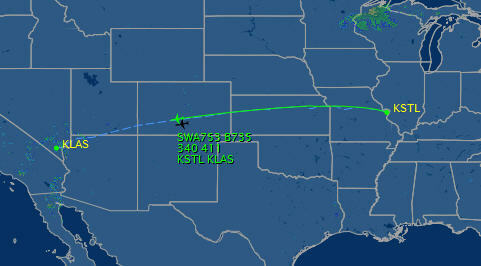 As you can see in the photo below, flight 753 is now flying over the southwest corner of Colorado. Not only do we get information such as flight time, we also get the amount of time left in the air, the type of aircraft, the departure and arrival gates, and-I love this-the amount that people paid for the flight. As you see in the photo, one person paid just $52 and another paid $1,645.96. Talk about airline fare disparity! Whoever paid that insane airfare to Las Vegas is either crazy or loves Vegas more than I do. 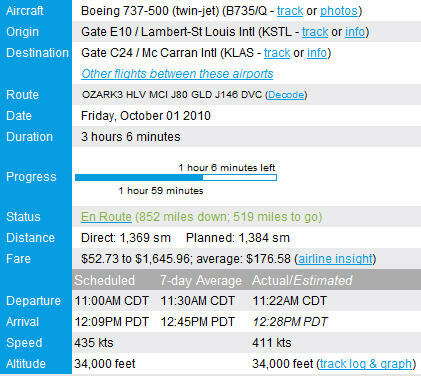 As you can see, it is extremely easy to view flight information online. In fact, to me, it seems much easier than picking up the phone and having to talk with one of those automated machines that annoy you so much. To review, if you want to watch a flight online, simply visit FlightAware, enter the airline information and flight number, and then enjoy the vast amount of detail about this flight online. Now, the next time someone asks you, “Where can I watch a flight online?”, don’t hesitate to tell them about this cool website! And, if you want to get real crazy, you can read the article Connect PC to TV and watch the flight unfold on your LCD TV.